Already a Rapid Rewards Dining® member? Dine three times for 1,000 Rapid Rewards® bonus points. Earn 500 bonus points the first time you accrue 1,500 points by dining. Earn 300 bonus points every time you accrue 1,000 points by dining. Earn 10 bonus points every time you complete a review. 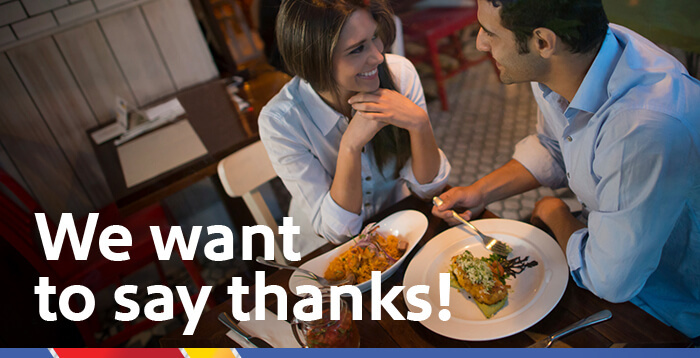 Rapid Rewards Dining® appreciates your loyalty, so we offer all of our members a Thank you bonus. Rapid Rewards bonus points – every time. This bonus offer is open to all Rapid Rewards Dining® members. You will earn this bonus when the total of your Rapid Rewards® point balance reaches 1,000 points. Your dining balance is determined by combining the points you earn from dining transactions at any participating restaurants, bars, or clubs and the points earned for each review you complete that is associated with a qualified dining transaction. The Thank You Bonus will award you a total of 300 bonus points. Please note that bonus points earned for other bonuses (New member bonus or First step bonus, for example) do not apply toward your Dining points balance. This bonus can only be earned after the First Step Bonus has been earned. The Thank You Bonus will be awarded each time your dining balance total reaches 1,000 points. There is no limit to the number of times a Thank You Bonus can be earned. Please note that if you do not complete a dining transaction for 365 consecutive days, your Rapid Rewards point balance will be re-set to zero (0) in your Rapid Rewards Dining account. Please allow up to eight weeks from the date your points balance reached 1,000 points for any Rapid Rewards points to post to your Rapid Rewards account. All Rapid Rewards rules and regulations apply and can be found at Southwest.com/rrterms. Southwest® reserves the right to amend, suspend, or change the program and/or program rules at any time without notice. Rapid Rewards Members do not acquire property rights in accrued points. The number of points needed for a particular Southwest flight is set by Southwest and will vary depending on destination, time, day of travel, demand, fare type, point redemption rate, and other factors, and is subject to change at any time until the booking is confirmed.